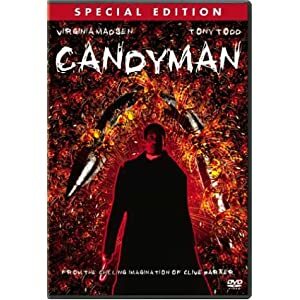 Candyman is a creepy tale based on the story by Clive Barker. It's about an urban legend which says if someone speaks his name in front of the mirror five times, he will appear and slash the person to death. A college researcher learns that Candyman is rumored to live in some nearby tenements and begins investigating. She discovers that Candyman is both real and unreal, a supernatural evil force. This movie is one of my personal favorites when it comes to horror films. It is a terrifying movie in a category entirely its own. This film is scary and disturbing - but in a good way. A great movie to watch when you need a good scare. I just saw this movie the other night on HBO. It's seriously creepy. At first I thought it was going to be stupid because the opening scene is pretty hokie. I really got into the story and kept wondering what was going to happen next. I didn't run screaming into the night or anything, but there were several times when I jumped back in my seat. Virginia Madsen does a very good job playing the researcher who is investigating the Candyman urban legend. Tony Todd was born to play Candyman. Using the housing projects of Chicago as the backdrop for most of the movie added realism and was very effective. Great movie!